Belarus has been described by appreciative visitors as one of the greatest unsung concentrations of artistic talent in Europe. Situated at the crossroads between northern and eastern Europe, saddled with a confused blend of natural beauty, Soviet imagery, and post-Soviet reality, and benefiting from a high parental demand for aesthetics education, Belarus could hardly help but be the epicenter of its own artistic scene. Tapping into that talent has been the job of the Belarusian State Academy of Arts (BSAA) since its inception in 1945. However, this institution, besides being a concentration of artistic talent, also provides an international forum through which its students can gain further exposure for their works. It is also one of the Belarusian schools of higher learning that accepts foreign students. At the end of World War II, called “The Great Patriotic War” by Soviet authorities, Belarus lay in ruins. When the Nazi Germans retreated, they left behind a countryside completely changed from its pre-war state. They left it a wasteland. 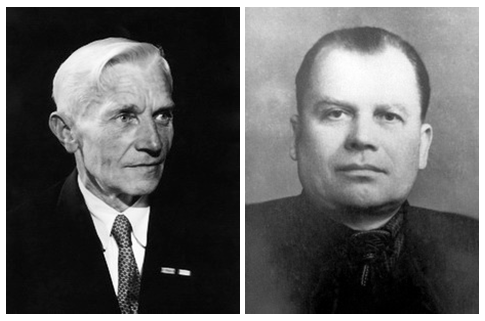 In 1945, Belarus literally had to reinvent itself. At the time, the Council of the People’s Commissars of the Soviet Union determined that part of this great task would be the creation of the Minsk Theater Institute, which would train in all aspects of entertainment, diversion and inspiration that could provide needed inspiration to the people of that war-torn land. On June 29, the council passed a resolution to allow admission of up to 90 students to this new academy, and appointed Mikhail Gursky to serve as its first director. When the doors opened to the Theater academy in the newly restored Minsk Pedagogical Institute a little more than four months later on Nov. 12, the first 27 students had enrolled to take theatrical classes. A year later, Gursky was replaced by Joseph Priess as rector, and he expanded the theatrical institute considerably. By 1953, the authorities approved a plan to reorganize the actor’s school into a fully-fledged Byelorussian State Academy of the Arts (BSAA). As a result, in addition to theater-related classes, courses were added in art, graphics, and sculpture. By the time of Priess’ retirement, an academic department of drawing and painting rounded out the course offerings at BSAA. The rise of a painting school brought the famous Vitaly Tsvirko to the school, who soon became rector in 1958. 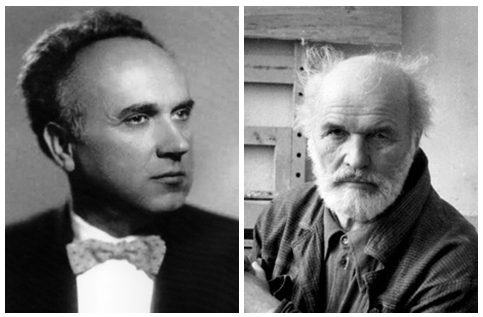 Tsvirko, who trained under Minsk masters Mikhail Stanyuta (father of famous Soviet actress Stefaniya Stanyuta) and Anatoly Tychina, and gained fame by painting war-inspired images after returning to newly-liberated Minsk in 1944, brought the focus of the arts community in the republic’s capital to the school. Tsvirko had taught at the Minsk Art School before coming aboard the new BSAA during the Priess-era expansion of the school’s course offerings. 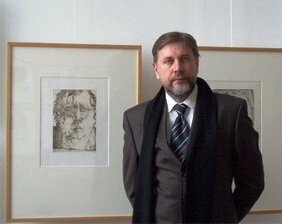 As rector, Tsvirko received the title of professor, and developed such important modern Belarusian artists as Leonid Shchemelev , Boris Arakcheev , Victor Gromyko , George Poplawski , Ivan Ray , Nicholas Kazakevitch, and Dmitry Oleynik. In 1960, Tsvirko left the academy in order to serve as secretary of the Artist Union of the USSR (later advancing to chairmanship of the Union of Artists in the Byelorussian Soviet Socialist Republic), and was replaced by the Art Director of the Byelorussian State Academic Bolshoi Opera and Ballet Theater, Pavel Maslenikov. Under this equally prestigious rector, the course offerings expanded to include ceramics, furniture and interior design, fabrics, and monument painting. The theatrical aspects obtained their own department, separate from the decorative arts, and included such courses as dramatic direction. Truly by the time he retired in 1964, the academy had become an important fixture within the Soviet theatrical world. 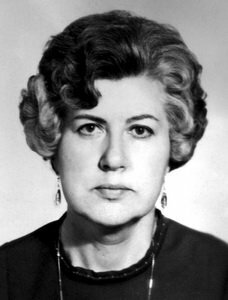 The longest-lasting rector, Elvira Gerasimovich, Ph.D., took over the posting in 1968, and served as the head of the academy through the Brezhnev era. Course offerings continued to diversify and included the likes of television direction and puppet theatrics. She served until 1984. The rector who oversaw the transformation of the Soviet-era school into the national artist academy was Vasily Sharangovich, who after taking over in 1989 further improved the theatrical offerings with feature and documentary film offerings and animation instruction. Musical theatrics also began to be taught in the early 1990s. Sharangovich was succeeded by Richard Smolsky, who in 1997 focused the school more toward educational outreach to young people. He opened a department focused on desktop publishing, among a wide array of other study options. In 2010, Smolsky finally stepped down and the present rector of the BSAA, Mikhail Borozna, succeeded him. It was under Borozna that the academy first focused on international cooperation and the admission of foreign students who shared an interest in the artistic traditions of Belarus. This school has been at the forefront of developing those traditions for nearly 70 years. Today, BSAA offers master classes in acting, directing, creating graphics, photography, painting, sculpting, and designing, all focused particularly on Belarusian style for each media. Exhibitions and film showings essential to understanding current trends in the country, and how Belarus relates to the world at large, are held in the academy. As a result of Borozna’s initiatives, BSAA plays host to students from a wide array of countries, including China, Iran, Korea, Latvia, Syria, Turkey, Turkmenistan, Russia, Ukraine, Kazakhstan, and the Czech Republic. Courses, however, are held in Russian, as they are in most of the rest of Belarus’ institutions. Most Belarus-based students live off campus. The 201 en-suite spaces in the academy’s hostel are in large part dedicated to the school’s international students. Each room includes a refrigerator and built-in closet, and common kitchen facilities, launderette, and reading rooms are provided. BSAA Rector Borozna has attempted to make admissions relatively easy for potential students. The first step is for the student to complete the academy’s application (downloadable from the school’s website), obtain a notarized translation into Russian or Belorussian of the student’s passport, and a notarized translation also into Russian or Belorussian of all applicable education certificates and transcripts. The Selection Committee will take copies of these documents and carry out an initial screening of the applicant, who may be required to send further creative work portfolios and documentation by regular or electronic mail. If the applicant passes the initial screening by the Selection Committee, they will send an invitation, which will be required to obtain a Belarusian visa. This visa should be obtained by the applicant appropriate to that person’s country of residence. Once travel arrangements are made by the applicant, the student will then need to keep the International Relations Department updated about the expected date of arrival. Once in Belarus, the student will need to submit to the International Relations Department the actual documents along with the certified translations that were submitted in the initial screening (certificate, transcription, etc. ), along with the original and translation of the student’s birth certificate, medical certification, and documentation of being HIV-negative (along with translation, if not in Russian or Belorussian). Additionally, the student will be required to submit 8 3×4 cm photographs, a copy of the Belarusian visa the student received, and an appropriate Russian language course certificate showing that the applicant is ready to receive courses in Russian only. 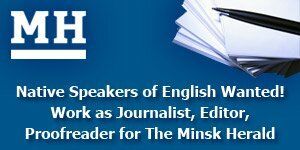 Once these are submitted, the student will go through an admission interview at the academy in Minsk, and then go and obtain registration for temporary residency from the “pasportny stol” of the local police station. After this, the student will then be required to pass a medical examination at the nearby Students’ Polyclinic No. 33 in the Belarusian capital, and then sign a contract for instruction. At that time, tuition will be due. Tuition costs for 2014-2015 have been set for full time undergraduate students at about 5,500 USD per year, for master’s degree students at 5,300 USD per year, and for post-graduate coursework at 4,300 USD per year. For part time students, the cost is 3,500 USD per year. If the student is required to take language preparatory courses, the costs is 3,000 USD per year. Tuition is payable in US dollars, and these rates are only applicable for the school year ending in May 2015.